We stopped by the exhibition stand of World Resources Institute. 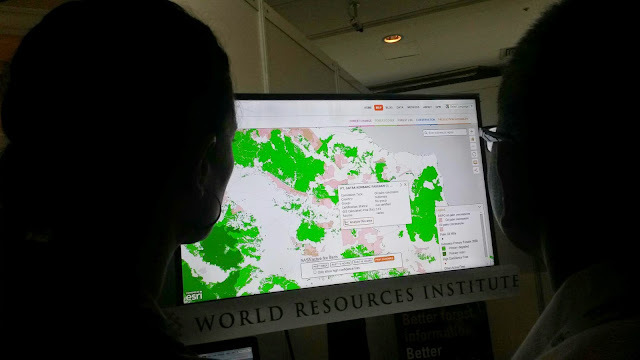 They have good online data mapping info to show on issues related to palm oil and environmental issues such as deforestation, fire and peat. November 14, 2014; Note: this is the first draft of a commentary I submitted to Yale Environment 360 last month. A final first-person version is available at A Conservationist Sees Signs of Hope for World’s Rainforests; "....Tropical forest loss has remained at stubbornly high since the 1990s, declining from an average of 11.3 million hectares during the decade to roughly 9.3 million hectares per year between 2009 and 2012. Ranking at the top during both periods were the usual suspects: Brazil and Indonesia, both of which have extensive forest cover and surging agribusiness sectors.... But hidden in these high level numbers is a trend that holds important implications for efforts to conserve the world's forests. Today forests are more often cleared to produce commodities for consumption in urban markets and for trade, rather than for subsistence by poor slash-and-burn farmers. In other words, the tropics are shifting from poverty-driven to profit-driven deforestation.